A 40-minute "short", Keep It For Yourself was originally commissioned as an advertisement for the Nissan Figaro, a car that was scheduled for release in the US market but was ultimately never sold outside Japan. Denis was assigned to shoot her film in New York, with other films to be made in Paris and Tokyo, though I've no idea whether either was made, nor if Denis's film bears any resemblance to the original commission. There's more than a hint of Jim Jarmusch in the film: shot in black and white, John Lurie is on the soundtrack, Jarmusch's brother Tom is involved behind the scenes, and the plot (very loose) recalls Stranger Than Paradise at times, as we follow a young Frenchwoman on her first visit to the US. We're in the New York of the early 1990s: rubbish-strewn, graffiti-scratched, and apparently crime-ridden, but Denis also portrays the city as a place of unexpected tenderness, humour, and care beneath the hard carapace. In a way, it's her Valentine to the city, and our first real sight of the place comes via a stunningly beautiful shot of a building-filled skyline, as the protagonist watches from a moving train. 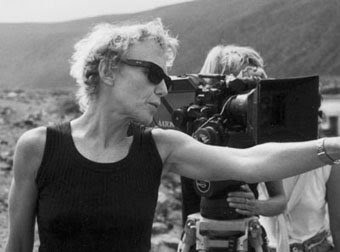 (In case there's any doubt, the picture above is not from Keep It For Yourself - I couldn't find any stills - but rather of Claire Denis at work on, I think, L'Intrus; the photo appears all over the web, and I don't know to whom it is credited).